Rosa Mendez and her mother share the same first name. In Spanish, it means “pink,” which also happens to be Rosa’s favorite color. She certainly plays it up. She pierced both ears with pink diamonds, she drives around with a pink Rosary hanging from her rearview mirror and she color-coordinates pink Nikes with her school clothes. 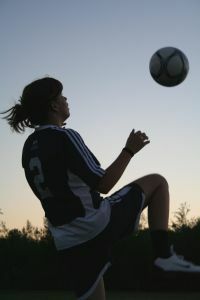 But hidden underneath all that girly-ness, her favorite sport — soccer — often leaves her body black and blue with bruises. She would get so lost in playing the game she loves during her spring season at East High School in Kansas City that sometimes she had no idea how she got so beat up. Soccer is Rosa’s passion. Or futbol, as it is called in the Mendez living room. In her home, as is the case in many traditional Latino families, futbol isn’t a sport played by girls named after delicate flowers. Rosa is the daughter of a Mexican father who works 12 hours a day and a Nicaraguan mother who works on an assembly line packing boxes with bottles of salad dressing and seasoning salt. She recently completed her junior season — her first high school soccer season — as a goalkeeper for the East Bears varsity team. Largely made up of Latinas (girls of Latin-American or Spanish-speaking descent), East’s roster is similar to those at several other inner-city schools, including Renaissance Academy, Alta Vista Charter High School, Northeast and Harmon, a Kansas City, Kan., high school with a Latino student population of 54 percent. These are daughters of northern Mexican immigrants, the first or second generation that has come here to build new lives. 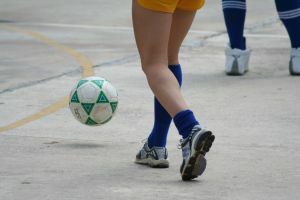 But while adapting to old-age American traditions, like playing for the home team, these teenage girls sometimes struggle to navigate between their own desire to compete and their family’s cultural customs. This isn’t simply machismo. Many community leaders suggest there are practical reasons why Latina girls are expected to stay home. Their parents may often work long hours for little pay and live in some of the poorest communities in the city. When a daughter becomes old enough, she is asked to help with the younger siblings in the house or take on a part-time job. So who really has time to play soccer when the family needs the help? Rosa gets more than her name from her mother. Her flowing brown hair and a smile that radiates her otherwise sad eyes, she believes, she gets from her mother as well. But Mrs. Mendez doesn’t always understand this daughter of hers. She’s perplexed about why Rosa is so faithful to soccer practice and to a team that didn’t win many games. She wonders why Rosa can’t stay home with her three younger siblings. Instead of coming home after school this spring, Rosa spent five days out of the week with her East Bears. At practice, Rosa would split time barking commands and encouragements, then sacrificing her thin, 5-foot-6 1/2 -inch frame in front of a net while teammates practiced shots. Midway through the spring season, the Bears’ starting goalkeeper — Zenadia Mendez, Rosa’s older sister — quit the team. East tried to fill the position with another player, and then Rosa got her opportunity during one game when the Bears fell behind 7-0. Yes, Rosa’s a tough one — and everyone on that soccer field knows it. Mama Mendez doesn’t exactly like her daughter getting slugged in the chops, especially in a losing effort. East lost that tournament game 2-1, by the way. Rosa loves soccer because the game is her escape. She loves her No. 4 jersey, washing it after every game and delicately hang-drying it for fear that the machine won’t get the wrinkles out just right. She loves being around her teammates, in the back of the bus, cracking jokes on the way to a game. She’d do anything for those girls and one day hopes to get matching soccer tattoos with teammate Brandi Roos. She caught the soccer passion at a young age. When she wasn’t watching Mexican League games on the living room television, she was tagging along to Sheffield Park to watch her father, Arturo, play goalie on a team made up of friends and family. She remembers watching her father and thinking: I want to play, too. Now that she’s playing again for the first time in three years, Rosa can’t decide whether it’s the game she loves so much or just the freedom it gives her. She used to play all the time, in the streets and for a James Elementary school team. But as Rosa got older, she took on more responsibilities at home. It is this very role — burgeoning homemaker — that community member Raquel Daldalian has found common among young Latinas. Daldalian points out that not all Latino families can be lumped together, but in her talks with a group of Hispanic girls from Northeast High School, their stories are all too common. In Nicaragua, Mendez did not play organized sports, but she enjoyed active days as a little girl. Mendez grew up playing made-up games around her neighborhood that constituted a lot of running and chasing. She smiles when recalling those days, when she was just a girl and the focus of her life was games the neighborhood kids would dream up. But when her mother moved the family to America, Mendez had to put away her childhood. Rosa will be 17 soon and, like most typical teenage girls, she cherishes her cell phone and boyfriend. At 17, her mother was working eight-hour days packing tomatoes in Kansas City, Kan. These days, Rosa is looking forward to her senior year. But at that same age, Rosa’s mother already was a high school dropout. There was no escape with soccer, as there is now for her daughter. She met Arturo Mendez in 1989, and the couple married six months later. They’re raising their six children in the same three-bedroom house on Wheeling Avenue that they’ve lived in since starting a family. Both Mom and Dad want to see their children leave this place and surpass them. Mrs. Mendez has a simple goal for Rosa — stay in school. Although Mendez wants the best for her daughter, she is hesitant to follow Rosa’s passion for soccer. “Sometimes,” Mendez sighs. “I don’t understand. The lack of importance associated with organized sports is evident in the Latinas who do play. Their families often cannot afford to send their children to youth leagues that would develop their skills. As a result, varsity soccer at schools like East and Alta Vista can be a rough sketch of what the game is actually supposed to look like. Alta Vista coach Greg Brenner, a Mexican American, took over the varsity squad this spring and inherited 17 Latinas. Many of them did not know how to properly kick a soccer ball. The reality for Rosa Mendez is that she has better things to be doing right now. She could use the money from her part-time job at Wendy’s to offset some of the expenses of her upcoming senior year. And on her off days, she could find herself watching her three younger siblings run around the house during summer vacation. But she wants to keep playing soccer. She’s found a street team named Hidalgo and minds the net this summer. When Rosa recently asked her mother whether she could play, this time ¿Por que? (Why?) was not the response. Her parents have come to understand why Rosa wants to play this game. Even as she struggles to explain the love herself.